We take a look at new singles from stars like Dierks Bentley and Gary Allan along with tracks from newcomers like Southern Halo and (the pictured) Farewell Angelina. This week’s ten new songs is an interesting collection of songs including stars making returns to the charts after time away while a handful of female groups take their shots at becoming the next superstar country band. There’s also a handful of other interesting songs included in this week’s rundown. Their voices blend superbly on the follow-up to “Somewhere On A Beach.” The mid-tempo duet has strong lyrics that compare the differences between men and women when a relationship ends. Interesting lyrics, interesting melody and strong blend of voices adds to a strong event record and future chart-topping hit. After returning to the charts as Chris Young’s duet partner on “Think Of You,” Cascade follows up that chart-topper with this strong radio-ready summer anthem that can even do well in the fall when it’s likely to peak. Cassadee has grown into her country music career since winning The Voice and this song is clear proof (as is the entire upcoming Summer EP honestly). For their third official single from Meat And Candy, Old Dominion is releasing this song, already a bonafide hit on SiriusXM’s “The Highway.” The song’s lyrics are cleve, the melody is infectious and the performance hard to beat. Should be another Top 5 if not a Number 1 for the band. 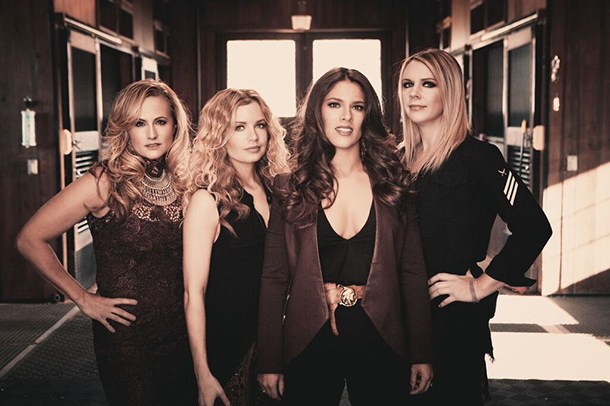 A talented family trio, Southern Halo is ready to break out with a sound that recalls SHeDAISY in all of the best ways: Family harmony, strong lead vocals and strong songwriting and playing. While the indie release may have a hard time cracking the larger market radio charts, Southern Halo should find a welcome audience with the “secondary” market stations, a group who is always willing and waiting to break out new artists before the big guys. “Rewind” from Southern Halo is a smash. If you ever wondered what kind of singer Chris Young was before this song, it’s easy to see what kind of vocalist Chris Young is: one of country music’s finest, if not THE finest male vocalist in country music. Passionate vocals, passionate lyrics and a country melody and the beautiful harmony vocals from Vince Gill just has this one the perfect single to release following the powerful “Think Of You” duet which recently topped the charts. It’s about time the talented vocalist and artist returns to the radio charts and this song, not unlike Joe Nichols new song “Undone” (see below), proves the more traditional leaning artist can fit in our modern playlists along with the “dance music” and “pop” songs. It may be different than what we’re used to but it’s not too far off the reservation. Welcome back, Josh, welcome back. Talented band we’ve previously shared some tracks on has delivered their first official single and like Southern Halo, they’re a group worthy of our attention. This four piece band has four distinctive vocalists and songwriters and on this song they sound ready for stardom. Hopefully radio will agree. After a long time with UMG Nashville label MCA Nashville, Gary transitions to EMI Records Nashville as part of his new contract with UMG Nashville. “Do You Wish It Was Me,” co-written and co-produced by Gary has some interesting instrumentals borrowed from Prog and Punk rock and blends that with a strong lyric from Gary. All of it amounts to what the song is: Interesting and very Gary Allan. He’s long been able to balance his traditional tendencies with mainstream radio-ready fare and “Undone” feels just like the kind of song that’s become undoubtedly a Joe Nichols song. It fits right in with his hits like “Sunny & 75” and certainly within current country radio & streaming playlists. The lead single from Cody’s forthcoming album Gotta Be Me, “With You I Am” is as good as anything on the mainstream radio yet also very country. Fans of Luke Bryan’s vocal style will find something to like here as the song kinda reminds me of some of Luke’s strong mid tempo ballads.